Just because I wax lyrical about working in Chinatown doesn't mean I don't appreciate having a genteel lunch in airconditioned comfort once in a while. My pal Casey took me to Chez Le Mamy, a charming French-inspired bistro on Ann Siang Hill where I got to lounge in a decadent armchair and savour a surprisingly light three-course meal. It was the kind of place where they don't have to post a "no cellphones allowed" sign; customers naturally switch their phones to silent mode and take their calls, if any, outside the restaurant. The owner and, it would seem, chef made sporadic appearances, emerging from the basement kitchen to swirl "Bonjour!" at random tables. Lunch was the set lunch: the smoothest, clearest vegetable soup I've ever had, then some supple seabass fillet with fresh aglio olio pasta on the side, and finally a neat dollop of creme caramel. They also have some fancy tenderloins on the menu that I'll have to bring Terz to try some time. Casey bought me lunch today, so I'll have to return the favour in the next couple of weeks. Any recommendations on a good place for lunch in the Chinatown/Tanjong Pagar area? I like Ember in the Hotel 1929 along Keong Saik Rd, but not sure how much their set lunches are; they might be slightly pricey. Pasta Brava along Craig Road has FANTASTIC pastas. You should try their squid ink pasta or even their homemade ones. The husband and I usually go there, order two squid ink pastas, gobble up and leave within half an hour. i second ember and pasta brava too! i like chez la mamy's escargots. not big on the seabass but their prawns and meats are pretty decent. Mmmmm...that sounds good. Eating out in Singapore is so rewarding! Oh, and Farmhouse Family Restaurant. FYI: The difference between Crème Caramel and Crème Brulée is that the sugar is burnt to a little sweet crisp crust on the top of the custard (hence brulée). Otherwise, the two dishes are identical. 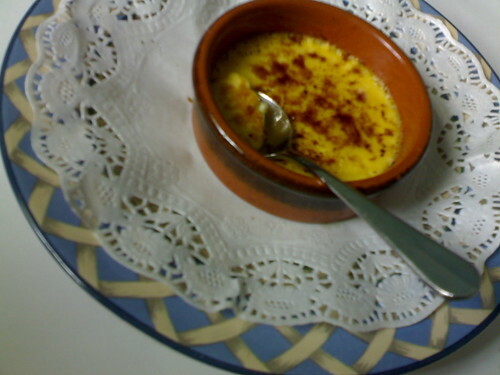 In Spain, Crème Caramel is called flan and in Italy, crema caramella. Just info because the photo piqued my interest.